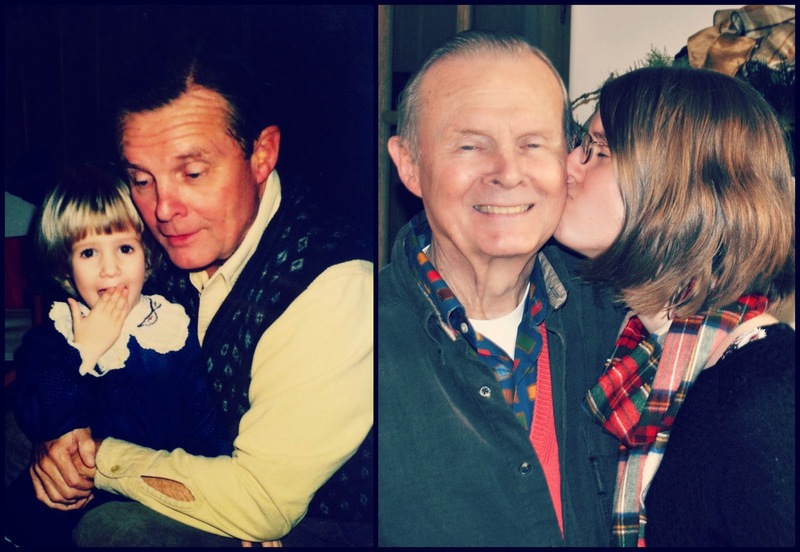 Ordinary Goodness: After your grandfather has a stroke. You go out to dinner with your mom and sweetheart and leave a place for your dad, who's still at the hospital, who has been there ever since he got the call from your grandmother earlier this afternoon and raced out. You've heard snippets from him over the speaker phone through the day... can't speak... weak right side... fidgeting... MRI... And it's hard to pull it all into your mind, to associate any of it with your sweet Pop Pop and his trademark quick wit, his storytelling, his still-brown hair (natural, even at 86! ), his keen and feisty grin, the loving squeeze of his leathery hand. It's hard to comprehend that he's gone from talking, eating and drinking at the Thanksgiving table to being tended, poked and prodded in a hospital bed. Dad arrives thirty minutes later, looking tired but heartened, happy for the food and drink and company. Warmth rises from intermingled voices and hearts, steaming plates of chicken and spinach, fries and blue cheese. He gives you the latest news, explains what he can explain. His brothers and sister have been there in shifts, and it makes you glad to think of your aunt and uncles surrounding their father and mother in love, actively being the stalwart and strong-hearted family you've flat-out adored since you were young. Dad's phone rings at the table, and nobody minds; this is life right now, and you listen to him give updates to your cousin, your brother, it feels like they are at the table too. Dad's voice mixes with the ordinary beauty of others' dinner topics. Indeed, his conversation has its own beauty: flowing through the explanations, the logistics, the medical jargon and concern, a strong current of care, of hope, keeps you all afloat. The next morning you walk down the ICU hallway with your family, the sights, sounds and smells of hospital jarring you with every turn. You get to your grandfather's room and hug your grandmother tight. She stands next to Pop Pop's bed and smiles, adjusting his covers, talking to you, talking to him, her husband of 63 years. Pop Pop's eyes are open, shifting to see. Everyone takes turns saying hello, and then you sit down next to him and hold his leathery left hand. His mouth twitches into an unmistakable smile. He tries to speak. "I think he said your name," Mom says, eyes shining. His fingers curl over yours, a loving squeeze. "One of my favorite hands to hold," you tell him, because it's true. You would sit here all day if you could, if you didn't have to drive through two states back to post-holiday routine. A minister friend comes in to offer a prayer, and Pop Pop's head bobs, aware, appreciative. You feel strength in the pastor's words, in the energy of love. Pop Pop's fingers stay with yours, you hold on to your mother, your grandmother, heads bowed, summoning light. When it's time to go, you tell Pop Pop that you're going to sing extra loud for him in church today. You see that nod, that smile, but still you don't want to leave. At church it's Advent, a time of anticipation, a time of hope. Friends and loved ones stop you as you walk in, asking for updates, hugging your neck. They know and love him as much as you do, how could they not? You sing loud like you told him you would, the words of the sacred season rising high, many voices building up courage. Rejoice in sorrow. Hope through fear. You're not sure how you'll do that, it's all a little surreal and out-of-body still. You take Communion and inhale your bread without thinking, before it's time to dip it in the cup. You start to whisper an apology, but your pastor simply pulls another piece off the loaf. "Just more grace," she says with a smile. It occurs to you that perhaps you took Communion for two. That though you left the hospital, you didn't stop holding his leathery hand. And no matter how this part of the story goes, you'll keep holding on. That's what grace does. That's what family does. That's what Pop Pop has taught you. So glad Mackay sent this to us. You say everything so very well. Thanks for writing it. God bless you Claire, an angel with words. Hold on now. This is life and you are right in its midsts. We take these journeys daily, and your words add comfort and direction. Keep your eye sharp and your heart open. I look forward to more about Frank, such a special man to us all. Wonderfully, tenderly written, Claire. And I'm not surprised at all. This piece captures who you are and lets people into a sacred place where they also see the folks who helped you become who you are doing "family work" at its best in a difficult time. "Holding you in the Light," as Don Saliers says. It's so true...you wonder how you'll get through It, whatever It is. But God gives us the strength to do and the courage to forge ahead, even if you haven't a clue about where that will lead you and what you will find there. So many people love Frank and Betty and your whole extended family. Let that be a source of strength and comfort. So sorry to hear this news. I will be holding you all in the light, as us Quakers say. Beautiful Claire. Straight from the heart. Sure have your family in my prayers. Claire, I'm appreciative of Mackay for sharing this, and of you for putting it into words. Our family just went through a very similar situation with my Mom, and you captured many of our same thoughts and feelings. My heart is warmed with the beauty of your words of the grace and love that permeate your whole family. You draw all of us to you and make us want to stay. Thank you for giving us who love, admire and enjoy your grandparents so much, a bit of pure light in the midst of this dark time. I, Janet Claire Segers Gary, am proud to share a name with you. thankyou Claire for sharing your heart in such a beautiful way . . . of course my prayers are with Frank and Betty and your entire family . . .
You capture much of it so very well. It's a look, a smile, an intonation that sounds just like what he always said. Hold on to the stories, the lessons, the love and the laughter. It is the meaning of life; being a part of something bigger that will always be better when shared. This is so lovely, Claire. I know your Dad from St. Andrews. And now I see why he's so proud of you and your family. This is so very special. So incredibly beautiful. Surrounding you and family in love and prayer!